The phrase “took an arrow in the knee” is old Norse slang for getting married? The origins of many marriage-related rituals are known by very few. One searches in vain to find any references in Norse languages or mythology that links the phrase ‘took an arrow in the knee’ to the concept of marriage, so we can safely rule out this explanation. The phrase “took an arrow in the knee” is actually of fairly recent vintage, a line popularized by the role-playing video game The Elder Scrolls V: Skyrim. Then, where did the tradition of getting down upon ones knee to propose marriage come from? No definitive historical explanation exists, but as many sources have posited, the practice is likely related to customs involving kneeling as a demonstrative act of both supplication and respect; During the Middle Ages, chivalry was not yet dead and formal courtship was the medieval version of modern-day dating. Kneeling was also the protocol for many ceremonial rituals and rites of passage, including those of the romantic kind. Medieval artwork and literature shows knights genuflecting before their feudal lord as a sign of honor and respect, or kneeling in front of a noblewoman to express their eternal servitude and admiration in a show of “courtly love.” Nevertheless, religion play a role as well. Many faiths, like Christianity, Buddhism and Islam, have their worshippers kneel in prayer to express their devoted service and everlasting respect for their God. In today’s world, kneeling has connotations of complete submission, giving yourself to the mercy of the other person who has the power to do whatever they desire. So when we propose in this way, we are showing that we truly trust our partner, and that we are completely committed to intertwining our life with theirs. It is also a respectful thing, which is nice, and shows that we are willing to break down our walls and be truly intimate;-As kneeling is placing yourself in a vulnerable position with all power to the person standing. 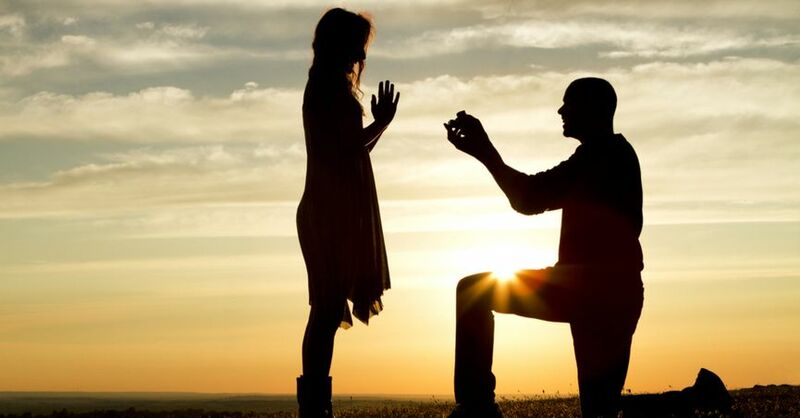 In short, offering a ring upon bended knee to propose marriage is a symbolic manner of expressing a fervent desire for a positive response, and of demonstrating that your beloved is deserving of your honor, respect, and love — not due to an old arrow injury.